Metatypical basosquamous cell carcinoma is a subset of cutaneous cancers that poses an increased risk of metastases to the patient due to its aggressive behavior. The classic histology of metatypical basosquamous cell carcinoma includes features of both basal cell carcinoma and squamous cell carcinoma, as well as areas of intermediate differentiation. The cells are larger and more squamoid, there is no palisading, and the stroma is fibrous rather than myxoid. The key to the diagnosis of basosquamous carcinoma is the absence of a transition zone between the basal cell and the squamous cell types. Basosquamous carcinoma is not a collision carcinoma of basal cell and squamous cell carcinoma. It appears that basal cell carcinoma undergoes squamous cell differentiation, which in turn alters its normal biologic behavior. Thus, these intermediate lesions have a greater tendency to recur and metastasize. Dr. Matthew Goodman remarked that metatypical basosquamous cell carcinoma, in and of itself, is an indication for Mohs surgery due to its aggressive biological nature. This needs to be differentiated from basal cell carcinoma with keratinization. Many basal cell carcinomas ulcerate; the resultant inflammation at the periphery induces reactive keritinization. The fibrous pattern can also be found in non-metatypical basal cell carcinomas. There, physical trauma, such as patient picking the lesion, may have been present overlying the basal cell carcinoma ulceration. Again, this is not equivalent to the more aggressive metatypical basosquamous cell carcinoma, but indeed represents variants of basal cell carcinoma behavior. Often, the use of the term basosquamous cell carcinoma does not adequately describe the nature of the cutaneous cancer and thus requires further definition of the term. True metatypical basosquamous cell carcinomas must be treated as highly aggressive tumors with metastatic potential. As clinicians, we must rely on our pathology colleagues to make that differentiation, and we must question each diagnosis of basosquamous cell carcinoma. This carcinoma behaved as a true metatypical BCCa with infiltrative features, deep aggressive fixation, and perineural involvement. There were clearly two cell types, basal cells and small spindle cells with desmoplastic reaction of the neuroendocrine component. The latter required immunohistochemistry for confirmation. Many lesions with basal and squamous cell component are called metatypical basal cell carcinomas without being true metatypical cancers. This is particularly prevalent on a biopsy diagnosis where the full extent of the cancer cannot be visualized given the small size of biopsy specimen. Most of those cases show either reactive keratinization or inflammatory surface squamous metaplasia. This case is the classic metatypical BCCa with its aggressive behavior and two cell types throughout the tumor. At SCARS Center, we performed the classic SCARS combined resection – Mohs excision with concomitant wide surgical resection of the tumor. 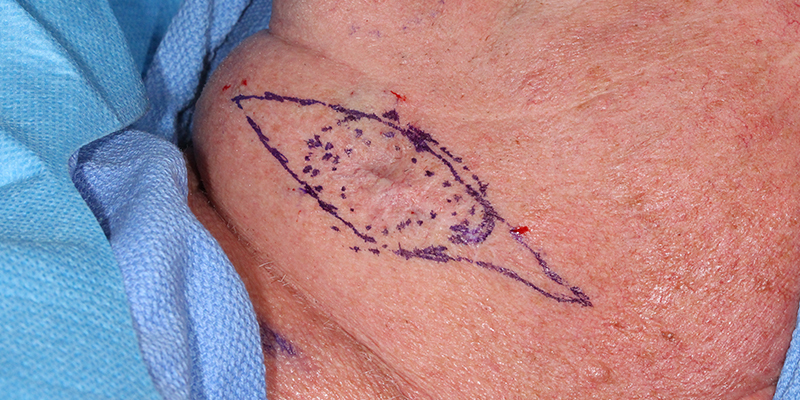 The lesion was treated with Mohs excision clearing the cutaneous margins and identifying the involved deeper margin. At the same time another BCCa (non-contiguous) was removed with Mohs just anterior to the lesion. The patient was then anesthetized and wide local resection of the cancer was performed. The tissue was submitted for permanent histologic evaluation. The final deep layer of periosteum was evaluated with intra-operative frozen sections and found clear of cancer. Due to a risk of lymph node involvement, superficial parotidectomy was performed. Reconstruction involved a fasciocutaneous island flap. Receive research updates, inspiring stories, healthy living tips and more. ELEVATING THE STANDARDS OF SKIN CANCER MANAGEMENT. © 2018 SCARS Management Services. All rights reserved.